DOC NYC PRO is co-presented by Amazon Studios. The first of two days focusing on the craft of nonfiction filmmaking. 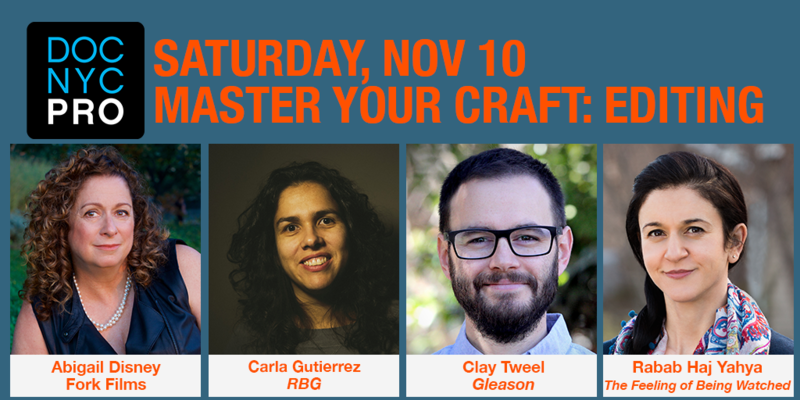 Saturday’s sessions will break down and delve into all aspects of documentary editing. BREAKFAST 9:00AM-10:00AM Open to all badge holders. Abigail Disney and Fork Films are a major force in funding documentary films. Hear her thoughts on what stories are the most important to tell. Open to all badge holders on first-come basis. Stephen Garrett (Jump Cut Creative), Anne Hu (HBO) and Kevin Tran (Oscilloscope) discuss the nitty gritty of what makes great, visceral trailers and how to craft one that best fits your film; moderated by Vanessa Gould (Green Fuse Films). Clay Tweel (Gleason, Out of Omaha), Penelope Falk (Step) and Richard Miron (For The Birds) break down key moments from their films and discuss how to cut with an eye toward finding the meaning in a scene. Moderated by Maya Mumma (O.J. : Made in America). Rabab Haj Yahya (The Feeling of Being Watched), Bryan Chang (Narco Cultura) and Rob Kuhns (New Homeland) share thoughts on crafting story during each stage of a cut and on ensuring that it remains truthful. Moderated by Tony Hale (Afghan Cycles).